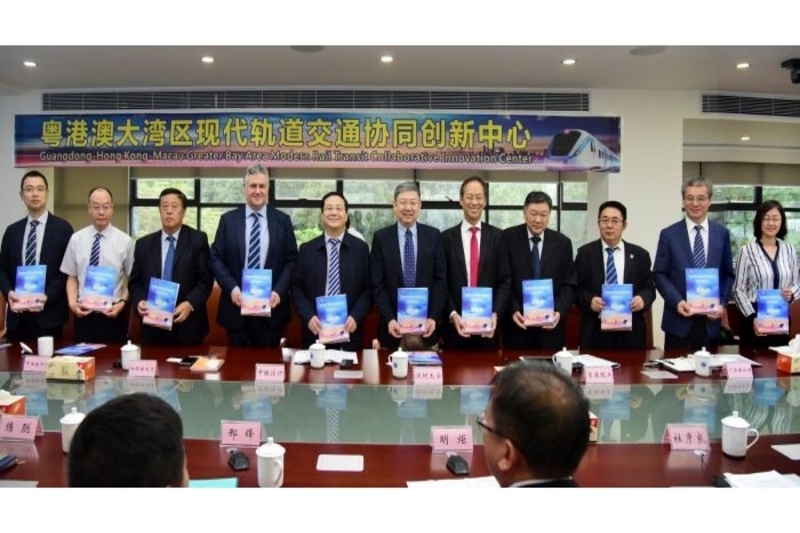 According to a recent press release, the Hong Kong Polytechnic University (PolyU) and Shenzhen University (SZU) announced that will jointly spearhead the establishment of the “Guangdong-Hong Kong-Macau Greater Bay Area Rail Transit Joint Innovation Union” (the Union). The two parties declared the news upon the signing of a memorandum of understanding (MoU) with 10 other universities and enterprises. The Union aims to advance research in the area of rail engineering, thus contributing to the development of the rail transit system within “Guangdong-Hong Kong-Macau Greater Bay Area” (GBA). The Union will serve as the joint innovation platform of rail transit in GBA through facilitating research collaborations between universities and industries. The Union will seek research and technological breakthroughs to cater to the tremendous needs of safe operations and maintenance of the rail transit in GBA. The research efforts will focus on smart sensing and health monitoring of rail infrastructure, safety alert mechanism, disaster resilience program, crisis contingency and recovery plan etc., to promote safe operation and maintenance of rail transit system. The Union will take advantage of the academic resources and strengths of the participating parties to foster talent nurturing in GBA and to promote technology transfer as well as commercialisation of the research outcomes within and beyond GBA. The Vice President (Research Development) of PolyU stated that by leveraging the ‘one country, two systems’ principle and the distinctive feature of internationalisation, Hong Kong has the full advantage to become an international innovation and technology hub. He added that Hong Kong universities play a pivotal role in the development of science and technology, grooming international talents and facilitating innovation and entrepreneurship. PolyU has been actively participating in various national research projects over an extended period, from space missions and high-speed rail in China to the recent research collaborations in GBA for technological advancement including the establishment of the first Biotechnology and Translational Medicine research platform, Joint Center for Immunotherapy and the Supercomputer Union. The President of SZU stated that the launch of the Union will provide a strong boost to the developments of GBA. The Union comprises of universities and research institutions within and beyond GBA, indicating a strong base for diversified cooperation. He believes the Union will bring about profound outcomes in the R&D of the rail transit system. An Academician of China Engineering Academy at SZU also remarked that the Union will take into account the needs for rail transit development within GBA in developing its research agenda with a view to facilitating the development of smart transportation system. The MoU was jointly signed by the Vice President (Research Development) of PolyU and the President of SZU as representatives from the two leading units. In addition, representatives from the 10 partners including Sun Yat-sen University, Guangzhou University, Beihang University, Southwest Jiaotong University and the University of Macau of China as well as those from colleges from England signed to MoU. Other signing members included various limited corporations. The Associate Director of the Department of Science and Technology at the Ministry of Education, the Deputy Director of the Department of Education, Guangdong Province also attended the signing ceremony together with many government officials and industry leaders.